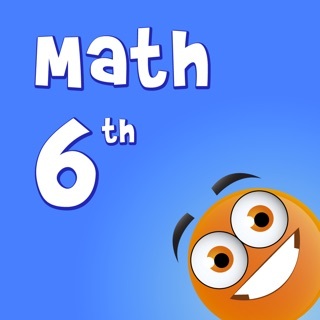 "Has changed our 9y/o's way of looking at math!" 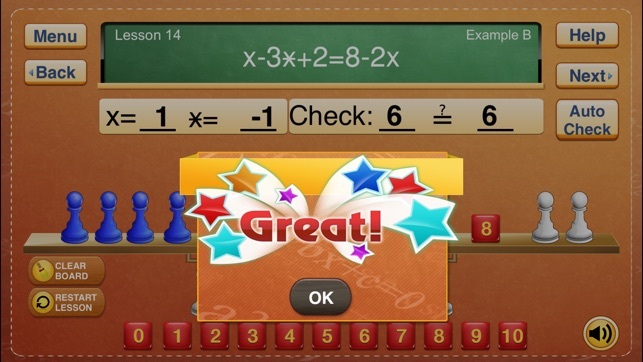 This app for the iPad is intended for students who have already completed Level 1 of Hands-On Equations. 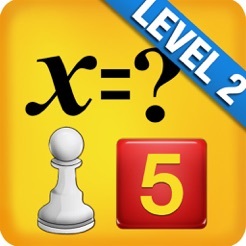 In Level 2, the student learns how to solve equations involving the white pawn -- whose name is "star" -- as well as the blue pawn and the red cubes. The white pawn is an unknown like the blue pawn. The value of the white pawn is the opposite of that of the blue pawn. Hence if x = 3, star = -3. Since their sum is zero, when the white pawn and the blue pawn occur together on the same side of the scale they may be removed without affecting the balance. The notation used for the white pawn is that of an x with a crossbar through it. It has the name of “star” since it looks like a star. Later on in the program the students learn to recognize “(-x)” as another name for star. In Level 2 students learn to solve equations such as 4x+(-x)+1=2x+5 and 2x-(-x)=12. A video introduction is provided for each lesson. 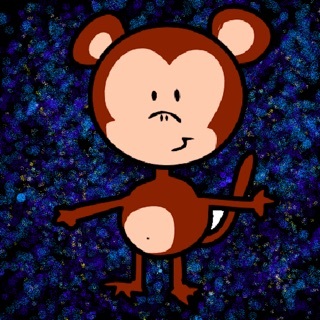 (See the sample YouTube video at http://youtu.be/VFYQ47EAqZw.) Each video introduction is followed by two examples and ten exercises. It is essential for the student to view the lesson video prior to attempting the examples and exercises for that lesson. Hands-On Equations is the ideal introduction to algebra for elementary and middle school students. Not only will students have fun and be fascinated with the program, their sense of self-esteem will be dramatically enhanced as they experience success with sophisticated algebraic equations. 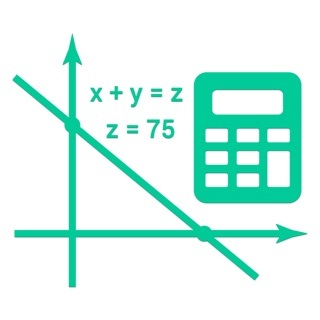 High school students struggling with algebra will likely experience success and understanding for the first time as they work with this app. 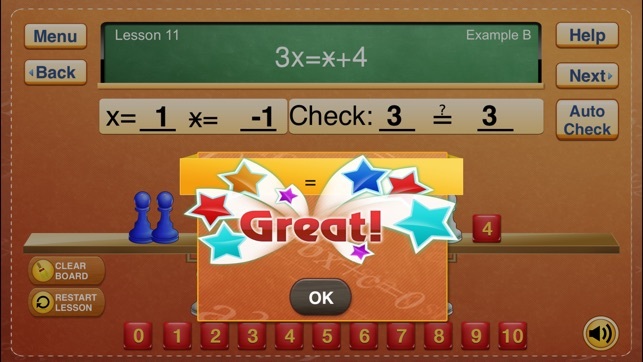 The video instruction for each lesson will enable your child to continue the success and enjoyment they had with the Level 1 app as they solve even more challenging equations! More information on Hands-On Equations can be found at www.borenson.com and on YouTube. Why? Why did my teachers not have this back in grade school? This would have changed my life. I was turned down from good paying jobs because I couldn’t do algebra. I was afraid of it because of terrible grade school experiences. 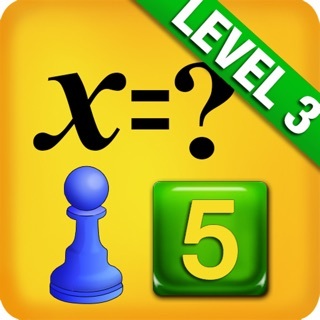 Want to learn algebra, look no farther, you NEED this app. It’s so easy. 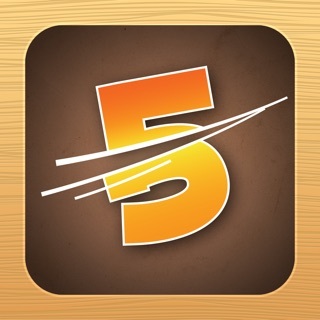 I rarely give 5 stars to an app. Maybe it will change your life. Kids enjoy it + kids learn = winner app!